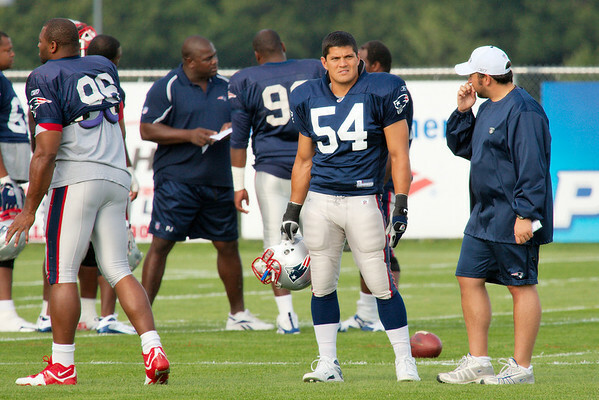 New England Patriots Training Camp, Gillette Stadium, July – Aug. 2008. All photos © 2008 Joel Shore. MetWest Gallery is in no way affiliated with the New England Patriots or the National Football League. Team logos are registered trademarks of the National Football League and players' likenesses are copyright of their rightful owners. Thus, these photos are for your viewing pleasure only and are not for sale. Send e-mail to the photographer, Joel Shore. No. 54 on your roster, No. 1 in your heart, Tedy Brushi.